A wonderful opportunity to look inside the world of floral design-one on one, to share in my passion, and to learn some of my signature designs. Flower arranging is an experience like no other; and one that I am passionate about sharing. I really feel everyone should immerse themselves into the flower world. It is one of the gentler arts that has been handed down for decades and always seen as a proud accomplishment. Whether you are an avid gardener or just an enthusiast interested in creating bouquets for yourself, for an event, a Bride, or maybe toying with a career as a future professional. These classes will open the door to give you a good foundation of both the creative & technical side of floral artistry. From the French spiral bouquet to that ‘effortless’ English garden vase; you will go away creatively enriched and no longer intimidated about “what do to with a bouquet of flowers”. The classes are for all levels from the stark beginner to more advanced. We will be working with all variety of flowers, capitalizing on seasonal and of course….local grown. The garden flowers, wildflowers, and herbs are abundant in New England from May to November; and November to April we will us the crops of of our temperate states. We will use many varieties in these interesting designs; those that you have become accustomed to seeing from my shop. No carnation and mum designs here! My teaching style blends the must have-technical training of proper mechanics with vintage nature, and a load of whimsy. I also make sure the classes are as instructional as they are encouraging of free thinking. All classes are held at the store in the design room, and include all supplies (except your tools). You will finish and take home your beauty at each class which last app. 2-4 hrs. depending on the project and your skill level. All class requests are contingent on both yours and my schedule. NATIVE SPIRAL HAND TIED BOUQUET The spiral technique can be used for any mixture of flowers. Giving a 3 dimensional effect by placing 1 item over the next while turning the bunch in your hand. This is the traditional design of European cut flower bouquets and wedding bouquets. Once you learn-you will never be the same! WILDFLOWER VASE ARRANGEMENT The technique for vase arranging seems to cause everyone the most frustration. We will solve your problem by using the proper balance, order of placement, and simple mechanics. You will be proud of your creations from this day forward! ENGLISH GARDEN CENTERPIECE The technique for creating a balanced yet ‘unarranged look” centerpiece includes a simple trick, equation I have taught for years. One that can be used in any container in any season and…the technique can also be used for any medium including dried and permanent flowers . YOUR CHOICE-Whether a specific décor item, event piece, wedding bouquet, or corsages. This is also available with artificial flowers whether mine or yours. Cost-Each class is $150.00 except the Fairy Garden which is $175.00 to include the collectable flower fairy-unless you have a fairy of your own to bring. (no larger than 7”) A 5% discount for 3 or more classes reserved. *Excepting Your Choice option which will be priced accordingly. 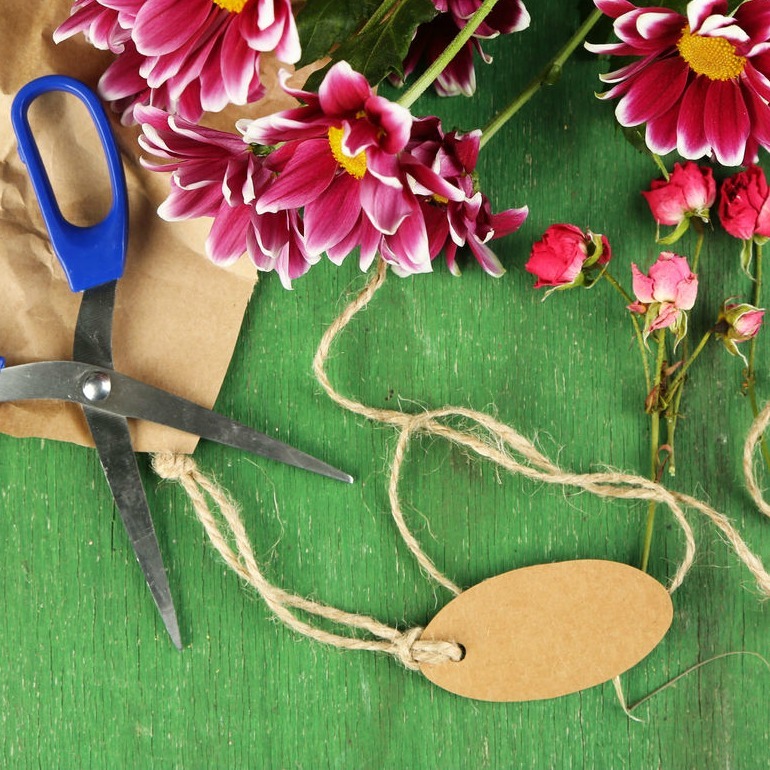 Supplies-All your flowers, ties, wire, and hard goods are included except your tools. You must bring a sharp knife (paring type), scissors, and clippers. Inexpensive, floral knives will be available for sale if you would like to purchase one, and call ahead if you would like to purchase clippers and I will have them for you. Length-Classes run app. 2-4 hrs depending on the class and your skill or speed. Extra-If you have garden flowers you would like to add to your design-please feel free! Parking-You may park anywhere around the store or across the street at the fire house lot. Please note: Unfortunately, florists never know what will be ordered on any given day, and there may arise a situation where I have to dedicate your class day and I must reschedule you. I will do everything I can to avoid this but If this occurs, you will be notified the morning of and we can hold the class on the next available day.